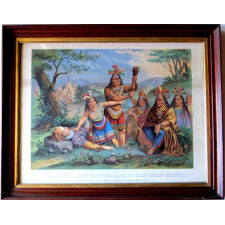 Antique Dealers Association of America - Pocahontas and John Smith. Chromo-Lithograph. Dated 1870. Rare. 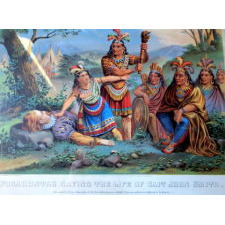 "Pocahontas Saving The Life of Captain John Smith" is a chromo-lithograph made by the "New Eng. Chromo Lith. Co. Boston" (printed on the lower left border). It is dated 1870. I have never seen this image before. 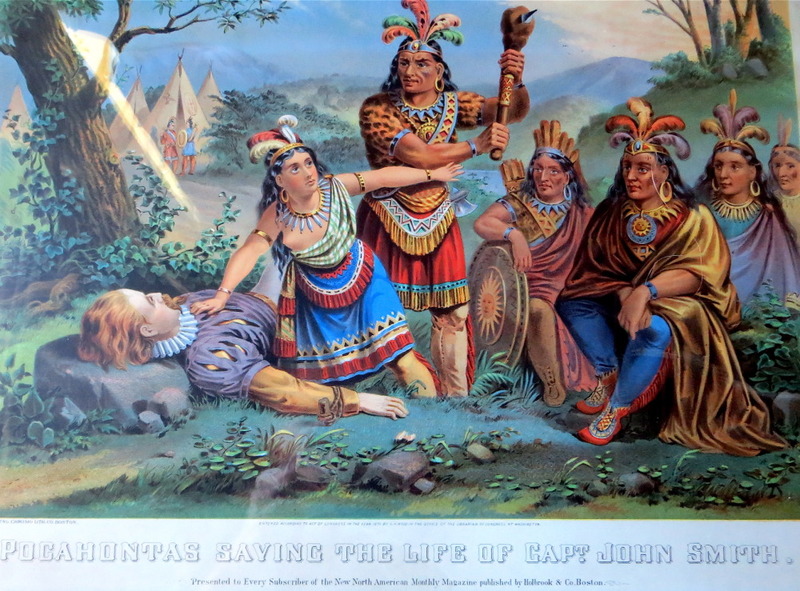 The hand colored lithograph depicts Chief Powhatan attempting to execute Captain John Smith by clubbing him to death, but he is prevented from doing so by his daughter (Pocahontas) who throws herself between the two adversaries. John Smith had been captured two months earlier---the incident having taken place in Virginia in 1608. He recounts his adventures in his memoirs in 1624. The story has never been authenticated, but the event has, nevertheless, become a permanent part of the annals of American historical folklore. In 1614, England had commissioned a then 34 year old John Smith to explore the territory of Maine and Massachusetts. Almost immediately upon arrival he named this area "New England". It seems only fitting that a Boston based firm, the "New England Litho.Co," would make this lithograph in 1870. The lithograph came out of an estate where it had been for over 100 years. I have kept the original "rough sewn" backing for date validation. I have had the back professionally protected with conservation board. Preservation rice paper has been applied to a time related rear tear which extends from the lower right third, to the right hand third of the image, and through the border to the lower right (see image). The tear is visible on the border, but it is not discernible in the field. 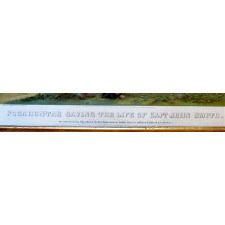 There is a "bar" stain to the border on the upper left and upper right (1" x 1 1/4") but it does not extend through the image. 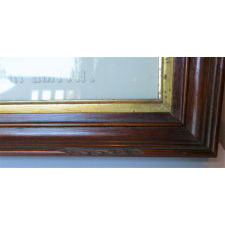 The original walnut frame is in excellent all original condition except for a minor 2" loss to a lower right edge (see specific image). 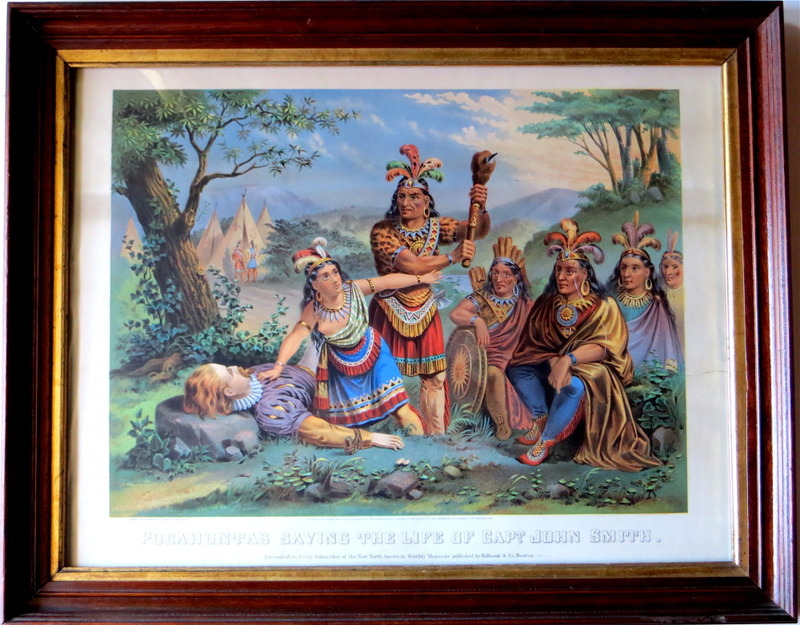 The exceptionally vibrant colors on this lithograph are as strong and vibrant as the day it was originally made. There is no indication of any fading. The images I have exhibited, are very representative. The strength of the hand painted colors rival those of, then competitor, Currier and Ive's. It is a beautiful rare image in it's original frame which shows very well.